With school out for the summer Jeff has a new early-morning schedule. So on Friday, June 19th, we were able to head down to the boat after work for a true full weekend on the boat. We were able to start the weekend by attending our first Friday Night event at Shenny. Every Friday evening during the summer the club holds “Friday Night.” People bring three dollars, a dish to share, and their own drinks. The club provides hotdogs, hamburgers, and all of the fixings. Typically more than 75 people show up each Friday, so we thought it would be a good opportunity to meet some more people. We arrived a bit later than we intended because Alex from our old marina dinghied over to chat for a while, but we still had a good time and met a few people, including a couple that had spent a year cruising in the Bahamas. Very cool. Saturday was cloudy with temps in the upper 60’s, and after lounging around the boat for the morning we headed out for a sail. Winds were in the low teens and we didn’t have any real destination in mind. We were simply going to sail. 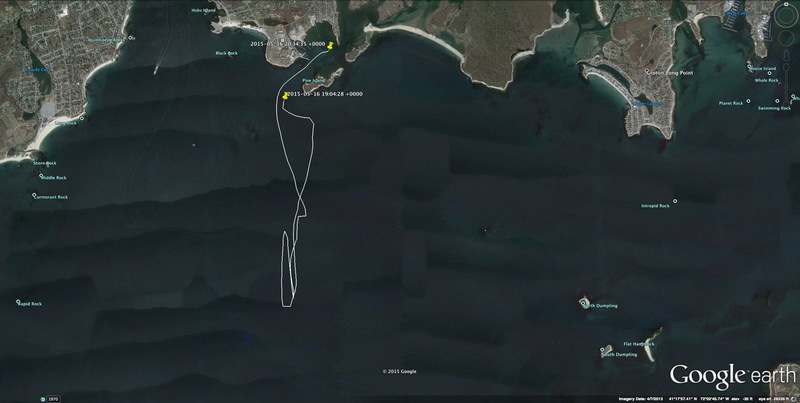 We practiced tacking quite a bit, trying to see just how close to the wind Pegu Club could get (answer: not very), and just generally enjoyed being out for a few hours and 10 nm. Pegu Club was splashed on Friday, May 1st so we headed down to the marina on Saturday the 2nd to get her rigged and hopefully go for a sail. The outboard for the dinghy is not cooperating yet, so we (meaning Jeff) rowed out through the nearly-empty mooring field. Pegu Club was one of the first three boats in the water. It felt GREAT to be out there again, and instantly made all of the cold weather preparations worth it. Climbing on board, the first order of business was to check the seacock installation and make sure there was absolutely no sign of water. Holding our breaths, we opened up the cabinet door and took a look (and feel). Success! Knowing that we weren’t going to have to radio the guys to give her an emergency haul, we got down to work. Rigging the boat went much more quickly than last year. At the end of our first season when we removed the sails, took off the boom, etc. we had taken many pictures from just about every angle. We figured it would help us when we had to reverse the process six months later. It did. We used a few of the photos this season, but it’s definitely getting easier to remember what we’re supposed to do. By the time we were finished we had enough time to sail, but absolutely no wind. Oh well. We cracked open a celebratory cider (for me) and beer (for Jeff), and loafed in the cockpit for the rest of the day. Sunday the 3rd also didn’t promise much wind, but we drove down to the marina anyway hoping that the forecast would be wrong. It wasn’t. We ran the outboard for twenty minutes (minor heart attack on my end when it stalled within a minute after starting, but Jeff quickly figured out I hadn’t sufficiently primed the fuel bulb – it purred like a kitten after that). More loafing followed. Saturday the 9th we drove down early hoping to get a sail in before heading back home to attend a party at our friends’ house. The wind forecast was light but workable, and we hoped we might be able to ghost along. After we were settled in, I looked around and saw such a pretty sight. I thought they were pretty until I learned they would keep us from sailing. “Look at the clouds, Jeff. Isn’t that cool?” “That’s fog rolling in.” Doh! There’s land just behind the boats. We had some wind, but no visibility. Thwarted again. We made some adjustments to the roller furler, and that was that. Sunday the 10th saw a last-minute change in plans, but we were finally able to try again on Saturday the 16th. By then we had learned that Jeff was going to be able to take Thursday and Friday off before Memorial Day weekend, giving us a 5 day weekend. Through a quirk in the calendar he isn’t going to get any “real” vacation time at his new job until July, 2016, so this is going to be vacation for the year and we’re hoping to spend it on Block Island. In order to feel comfortable with a sail of that distance so early in the season, however, we really wanted to get a “shake down” sail in first. It wasn’t sunny, but it wasn’t foggy, and while there wasn’t going to be much wind, it would be enough. Although it was very calm at the mooring, the water didn’t look as glassy just outside of the Bay so we took a chance that there would be enough wind and headed out. Temps were in the mid-50’s, the wind ended up to be around 5-7 knots out there, and we enjoyed simply sailing aimlessly for a while, practicing our tacks and jibes. 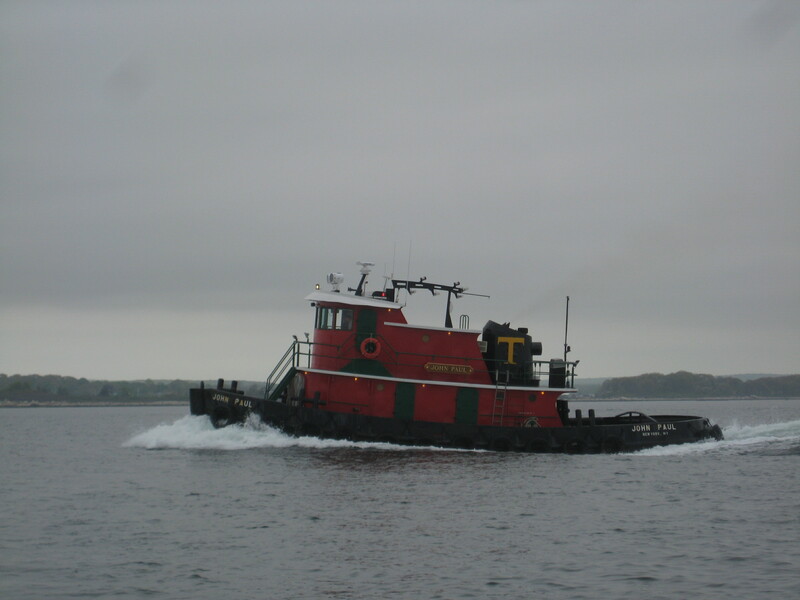 It felt great to be out there, and we had virtually the entire Sound to ourselves, sharing only with an occasional motorboat, the tugboat John Paul from Newport (who passed us when we were motoring under the Newport Bridge last fall! 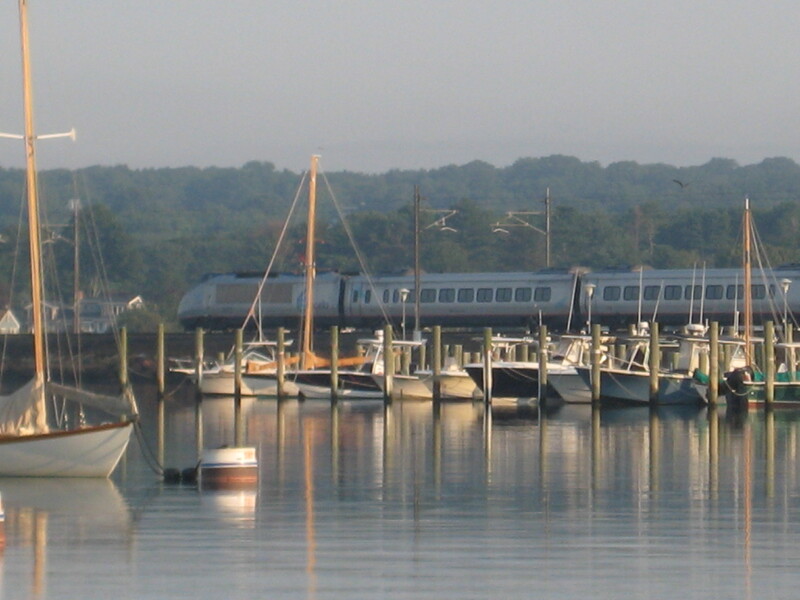 ), and the ferries. 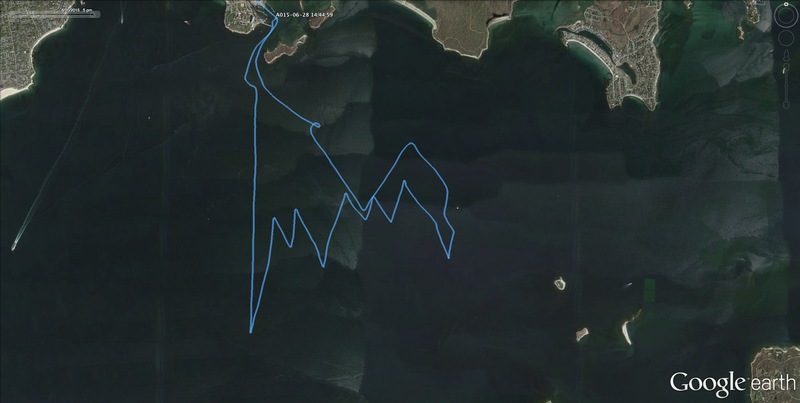 4.54 NM from the time I remembered to turn on the tracking, 3.0 knot average including motoring back to the marina. The John Paul from Newport, RI. The conditions were perfect for the first sail of the season, and as we were out there we took note of a few things we had forgotten to do (put cotter pins in the turnbuckles, lubricate the jib cars). Although we wanted to stay out longer, we were both getting a little chilled and the light wind we had was starting to die, so back in we went with our first sail of the season under our belts. Before the season began we had discussed how we should trade roles this year. Like most couples, we had settled into a groove. In our case I worked as the helmsman the vast majority of the time, while Jeff raised and lowered the sails, handed the sheets, and dropped/picked up the mooring line. While there’s nothing wrong with that, we really should get to the point where we are comfortable and proficient at all of the tasks. That way if something were to happen to one of us, the other would still be able to sail the boat and get us back in. We figured for the first sail of the season we would already be a bit rusty, so why not jump right in with the role reversal? Jeff motored us in and out like a champ, taking us right to the mooring ball. I raised and lowered the mainsail (and realized I should bring a winch with me next time), unfurled and furled the jib, and handled the lines. Overall it went well, but I’m glad we’re going to regularly alternate this year because I need a bit of work on my line handling technique. After we were back on our mooring and had tucked everything away, I practiced rowing with the dink. Jeff has been tossing around the idea of rowing the dink instead of having an outboard, whose main job seems to be to torment us. There are definitely some pros and cons to the idea, so we’ve been testing it out for now. I like rowing, but rowing in a straight line continues to elude me. Hopefully with more practice. That’s another Bristol 24 in the background. Jeff watching the sun try to burn through the clouds. We enjoyed our first overnight on the boat, grilling some sausage with arugula and sun-dried tomatoes for dinner. 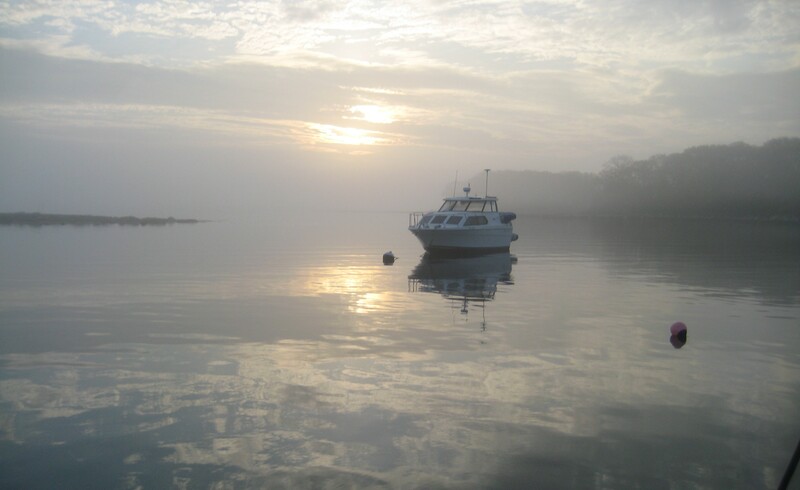 The water was calm all night, and it felt great to once again feel the boat gently rocking as we fell asleep. The next day promised to be beautiful – mid 70’s and decent wind. We were up early to help out at the club’s sailing school breakfast (the club will be the subject of a future post), and when I poked my head out it was such a pretty sight. Bright and early on Pine Island Bay. Unfortunately, if you look closely you can see a harbinger of the day to come. Fog. And lots of it. I think the problem is that it’s been unseasonably warm but the water is still extremely cold (low 50’s). 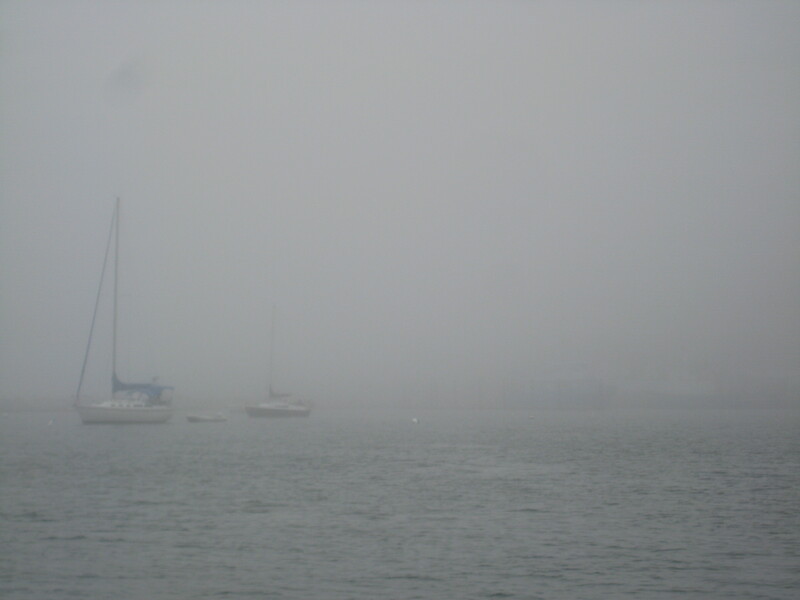 It was bright and sunny on the mooring, but just outside of the bay you couldn’t see a thing. 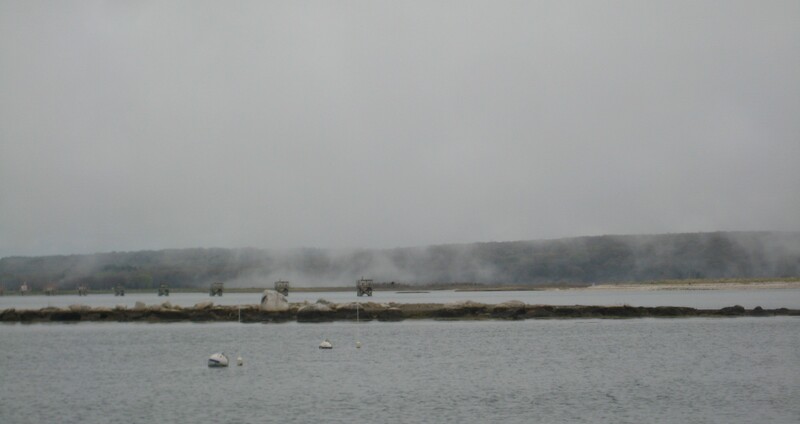 We couldn’t see Fishers Island, the New London Ledge, the North Dumpling. Nothing. We weren’t going anywhere. 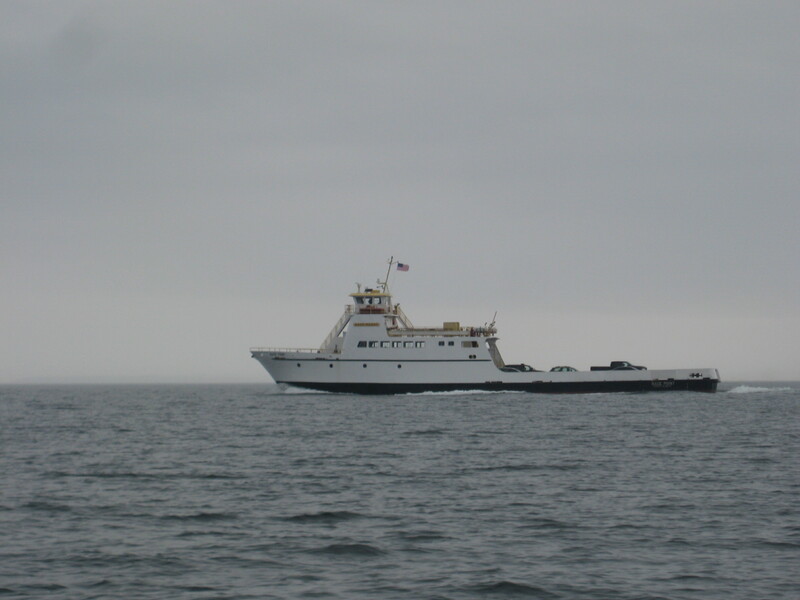 So it looks like our next sail will be on Thursday to Block Island, weather permitting. It will be the first time we’ve sailed there in May, and I’m really looking forward to seeing how different the island looks in the spring vs. the fall. We’ll be bringing our new manual foghorn with us that we decided to pick up at Defender on Sunday. Hopefully that will ensure that we won’t need it! Monday dawned every bit as gorgeous as the weatherman predicted. While the timing wasn’t good for a favorable current home, the forecast was for 12-13 knots of wind so we figured that would offset the current nicely. One of the things that I particularly enjoy about Dodson’s are the Amtrak trains that regularly go by. They are far enough away to not be too loud, but close enough to watch. I have an affinity for trains, and when we’re at Dodson’s I’m a bit like Doug the dog from the movie, “Up” except that instead of “Squirrel!” it’s “Train!”. Once I had my fill of trains we took a walk through the borough. 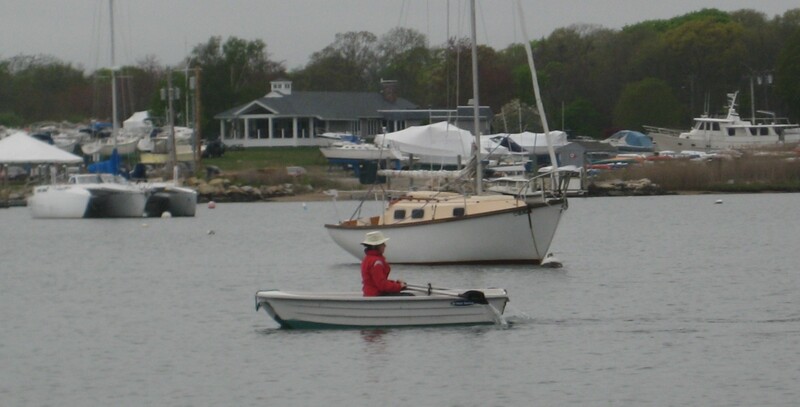 Stonington Borough is quintessentially New England. Cute and historical houses, independent shops, a mural that cracks me up every time I see it. 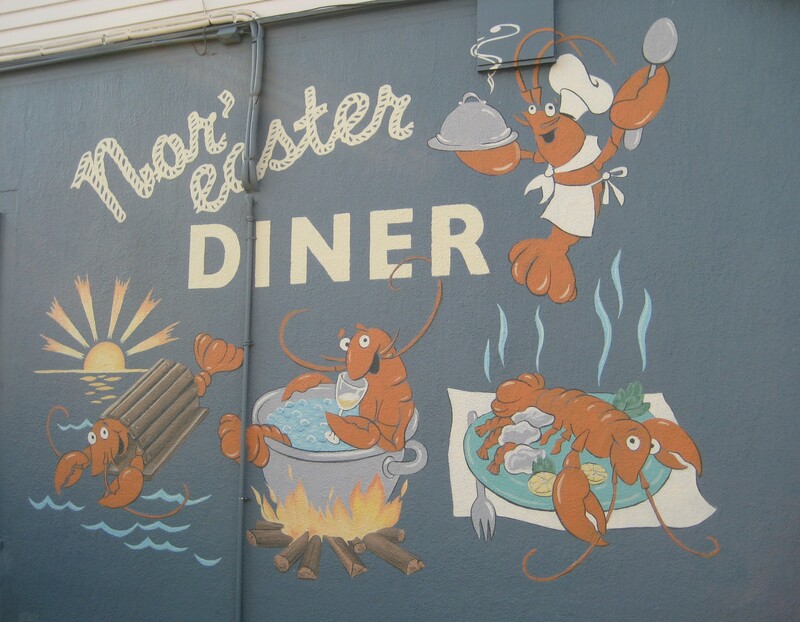 There’s something about the lobster in the middle, soaking in a pot with a smile on his face and drinking champagne. But I think our favorite part of Stonington is the ability to purchase the best scallops on the planet – Bomster scallops. I didn’t particularly care for scallops until I tried these – half-dollar sized, sweet, delectable. When the Bomsters catch these deep sea scallops, they shuck them on the boat, rinse them in sea water, and then flash deep freeze them. No ice crystals, no fresh water, no chemicals. They are simply amazing. Every time we eat them I comment on how much I’ll miss them when we finally cast off the lines and sail away. My co-workers even have a standing order for whenever we’re in Stonington, having tried them when I brought some back from previous trips. The Bomsters deliver their scallops to restaurants from New England to the mid-Atlantic region, but we are spoiled in that we can easily buy them at Stonington Seafood Harvesters whenever we’d like. 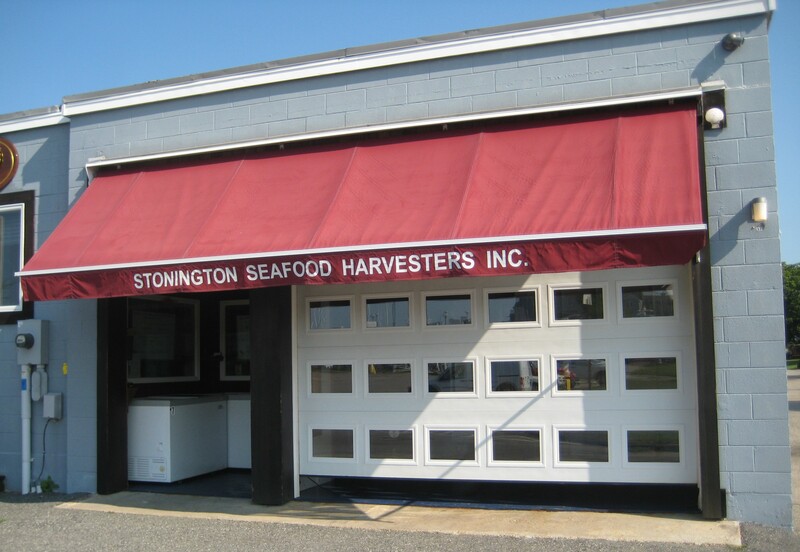 Stonington Seafood Harvesters sells their scallops right from the dock using a self-serve honor system. Yes, that’s correct. It’s the honor system. The scallops and other assorted seafood are in freezer cases at the front of the building. There’s a hand-written sign with the prices, a calculator, a credit card machine, and a slot to put the credit card receipt or money in. Take want you want, add it up, swipe the card, enter the cost, sign the slip, put it in the slot. It’s a real treasure, and one that we don’t take for granted. You can see the self-serve freezers on the left. 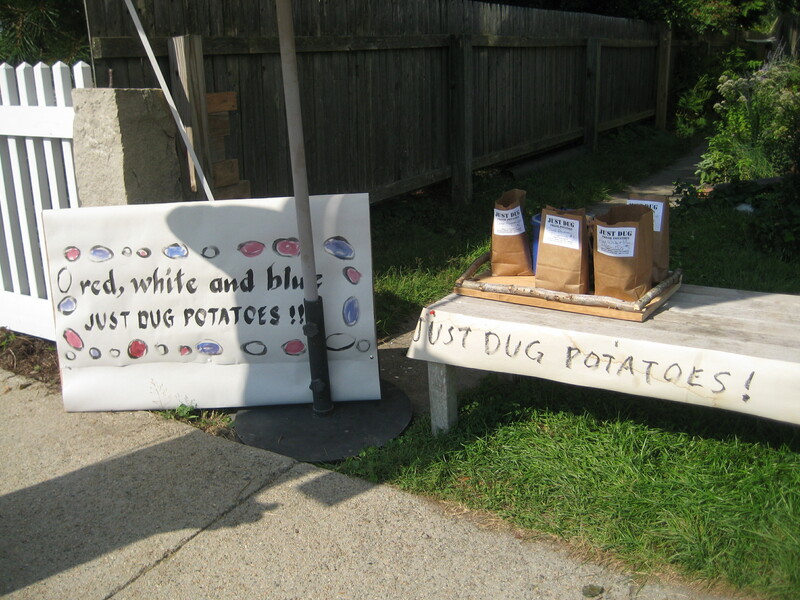 After we had purchased four packages (one for us and three for co-workers), we continued walking back to Dodson’s and came upon a potato-selling stand in front of someone’s house. “Just Dug” potatoes, $3, and again, a small jar for the honor system. Of course we bought some. 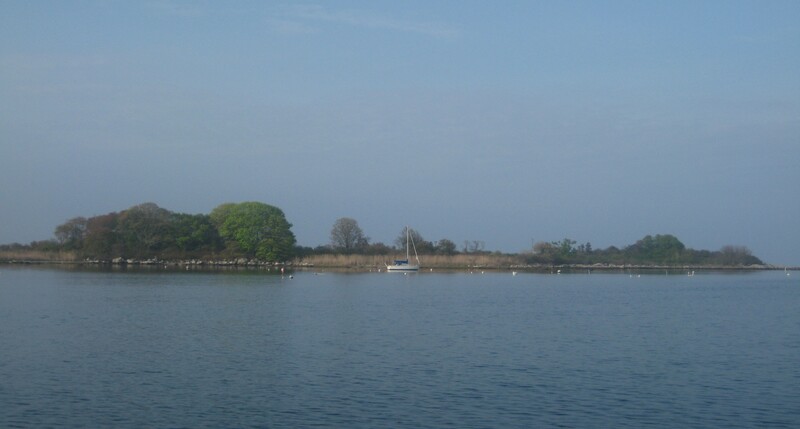 I love Stonington! Back on the boat at Dodson’s, we prepared to cast off the mooring line and head back to Groton. We fired up the outboard, Jeff let the line go, we started to motor away and within five seconds – dead silence. Crap. The prop was tangled in the mooring line. This was the first time this had happened to us, and my first instinct was to try to steer towards another mooring ball so we wouldn’t bump into any of the mega-fancy boats around us. After about 5 seconds I realized that it wasn’t a concern. If we were tangled in the line, we weren’t going anywhere. Dodson’s has two pickup sticks on their moorings so we used the boat hook to catch the second one and hooked it onto the cleat just to be extra careful. Then Jeff hopped into the dink to try to untangle us. Jeff made some progress but eventually we decided we needed to radio Dodson’s. Every staff member there is so professional and friendly, and soon one of the launch drivers came out to help. We chatted while he tried to untangle the line, discovering that he was leaving in ten days to enter Old Dominion as a freshman electrical engineering major, and he had sold his Boston Whaler to help pay for school (“It was a sad day.”) He was able to untangle most of the line, but the thinner line leading from the stick was jammed between the prop and the shaft, so he radioed his boss. As we waited he said this happened all of the time, and just two days ago somebody had sucked the line deep into an inboard engine. Ouch. After the boss worked on the line for a while, he finally determined that the prop would need to come off. He asked if we had any tools, and fortunately we have an entire toolbag filled with them and plenty of spare cotter pins. This helped us to feel a bit less like a couple of doofuses. So with everyone pitching in (the soon-to-be ODU freshman keeping the workboat in place, Jeff handing tools to the boss, me trying to keep the outboard lifted up just a bit higher, and the boss working on the prop), we were eventually free. The whole thing had taken over an hour and when I asked what we owed for this fine service we were told “No charge.” I’m telling you, this place is amazing. Needless to say we tipped them both VERY well! Normally when something like this happens (and it always involves the stupid outboard), we don’t sail for the rest of the day because we’re a bit stressed out. In this case we had no choice since we needed to get back to Groton, so we took about 30 minutes to regroup and then headed out again. During the interim we did what we always do after this type of “adventure”: we talk about what happened and how we can prevent it from happening again. We decided that I need to give the outboard more throttle when Jeff unhooks us, and Jeff needs to hold onto the line for a second and then try to toss it away from the boat vs. simply dropping it. With that new strategy in place and my heart in my throat, we dropped the line and motored away without incident. As we left the harbor we exchanged hearty waves with the the soon-to-be ODU freshman who had gone back to driving the launch boat, and we passed the breakwater feeling ready for a good sail. And what a sail it was! The best one of the season. The winds were around 7 knots out of the SE but were forecast to pick up to 12 knots. 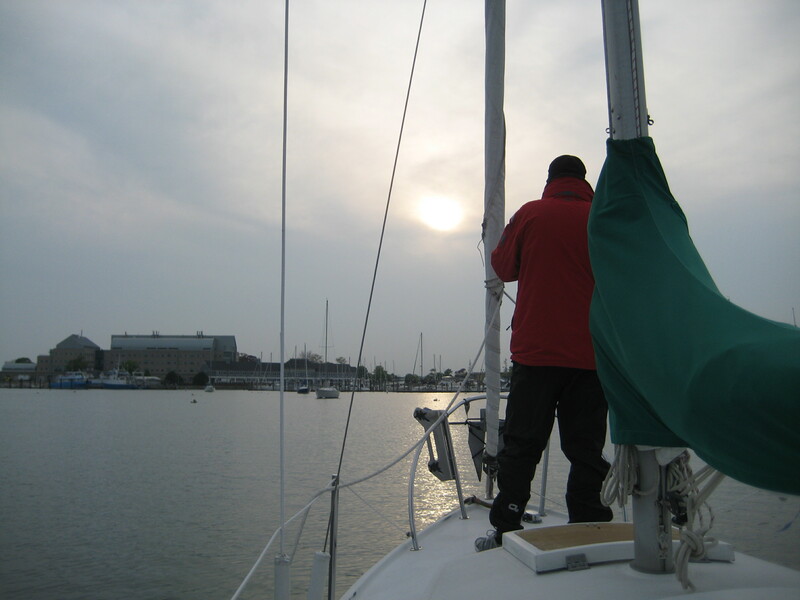 We hung a right towards Groton and settled in on a broad reach. After about a half hour the winds picked up as promised to 12-14 knots, and even though there was a strong current against us we were still making 3 knots. Our course was going to eventually turn slightly to the NW at which point we were going to try to sail wing and wing using the preventer we had made, but as we got to that point the winds shifted to the south so we were still between a beam reach and a broad reach. Pegu Club was FLYING! She’s such a great boat – you could tell she was so happy in those winds – and so were we. Ultimately, it was what we call a “set it and forget it” sail the whole way back. No tacking, no jibing, just a bit of trimming the sails every once in a while. It was amazing. We’ve never experienced that coming back from Stonington before because usually the prevailing winds are SW so it ends up being a tack fest. Not this time. Poseidon made it up to us after our inauspicious beginning that day. Coming into Pine Island Marina the winds died down as if on cue, and we commented on how if we hadn’t been delayed leaving Stonington the conditions wouldn’t have been nearly as perfect for our return sail. This was one time where it really worked out for the best.